Welcome to the GULF Oil Freight Cars Page. 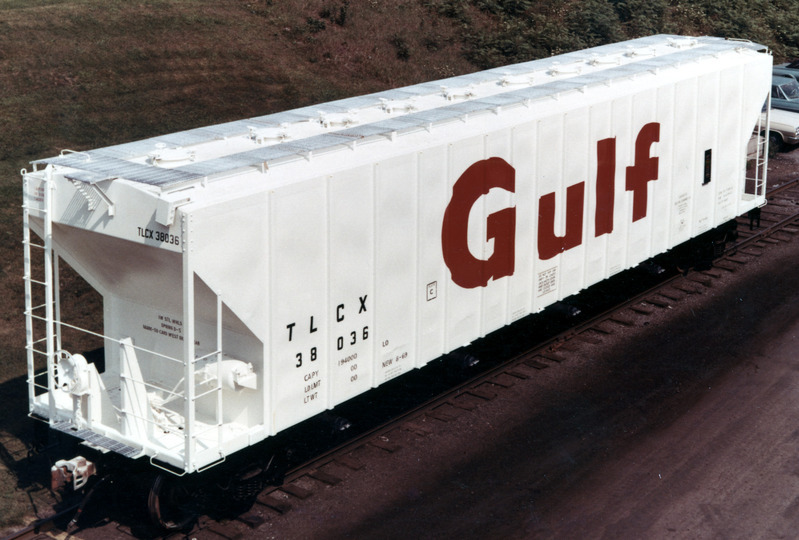 Gulf leased a number of freight cars under various reporting marks including its own (GRCX) over the years. It is known that they operated a fleet of PS 5650 ft3 three bay covered hoppers with TLCX reporting marks. PS owned these marks (among others) and used them for both experimental prototype designs and for lease to various clients. Gulf also leased other cars from PS with PTLX and PLCX marks. They also leased cars from other lessors with marks such as SHPX and probably others. They also operated a fleet of tank cars with the GRCX marks and those of Warren Petroleum, WRNX, which it bought in 1953. As more information comes in, I will post it here. If you have any information or pics of GULF lettered freight cars, please feel free to share and I will be happy to post it here.